The term Allergy is best considered to mean an adverse and often inappropriate immune response (involving our body’s defence system) to a protein (allergen) in our environment. Allergies can develop in anyone to virtually any thing at any age and “overnight”. They are memorised responses and should therefore be consistent on re-exposure. 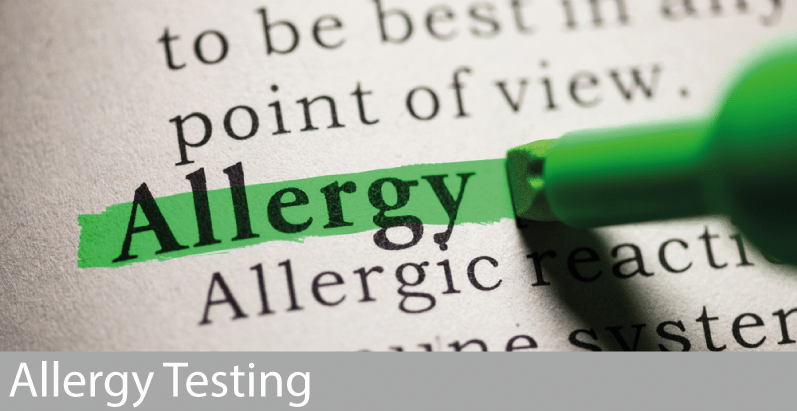 The type of symptoms experienced by someone who is allergic is dependent upon which part of the immune system is initially deployed following allergen exposure. If it is the immediate part of the defence system it involves antibodies (IgE) and histamine is the main chemical mediator. Common allergens causing immediate allergic reactions include airborne ones (eg pollens, dust mite faeces, animal danders, mould spores etc.). These exposures could result in the development of hayfever like symptoms involving the eyes, nose and lower airways and exacerbations of asthma. However, they can also be triggered by foods (eg cow’s milk , egg, peanut, tree nuts, fish, shellfish etc.) These reactions can result in itching/swelling of the mouth and throat, itchy skin rashes, gastrointestinal effects (vomiting, diarrhoea, abdominal pain) and occasionally anaphylaxis. Immediate allergic reactions may also be triggered by medications (eg penicillin) or bee or wasp venom. If the delayed arm of the defence system is deployed then as the name suggests these reactions take longer to be elicited and involve different cells and chemicals of the immune system. This is the sort of allergy that people develop to chemical exposure and generally when these chemicals come into contact with the skin they result in allergic contact eczema/dermatitis (eg. allergic reactions to cosmetic ingredients such as preservatives, fragrances, hair dye chemicals etc.) Some people may develop allergic contact dermatitis following exposure to chemicals at work. Delayed allergic responses can also be responsible for some cases of occupationally induced asthma. Some reactions to foods may also involve the delayed arm of the defence system which might affect someone’s skin – contributing to the development of eczema- or causing adverse effects on the gut with pain and diarrhoea eg non IgE mediated allergy to cow’s milk protein. This description and distinction is extremely over-simplified and in many cases both the immediate and the delayed part of the immune system are deployed together. However, we investigate the different arms of the immune system with different tests and if an allergy is diagnosed then exclusion/avoidance/reduction of exposure should result in an improvement of symptoms.